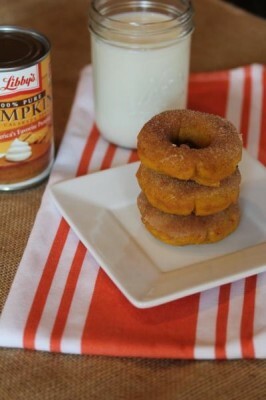 My daughter saw a recipe recently for pumpkin doughnuts and could not get them out of her mind. She knew we had to come up with a gluten free version of the recipe. So, last week when my husband and other two kids were watching OU football, my daughter and I set to work making gluten free pumpkin doughnuts. And yes, my daughter and I enjoy cooking more than football, what can I say. OU football, or any football, for that matter is not our thing. I know football fans don’t understand that, but at least my family got some delicious gluten free pumpkin doughnuts out of my lack of interest in the football game. These turned out delicious! 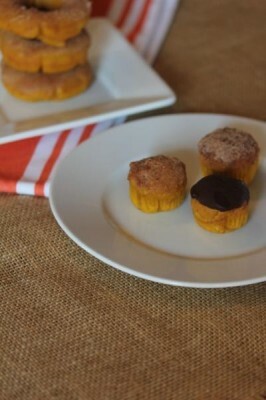 The pumpkin kept them very moist and gave them a great texture that is hard to get in gluten free baking. There is no grittiness to these. They are moist, soft, and delicious. I wanted to dip them in cinnamon and sugar, my daughter thought chocolate sounded better, so we did both. Both were delicious. My husband and I preferred the cinnamon ones, my kids preferred the chocolate ones. So, you might want to make both kinds. And if you don’t have a doughnut pan, don’t worry you can use a mini muffin tin and it works fine. Lightly grease doughnut pan and set aside. In a bowl beat together oil, eggs, sugar, pumpkin, spices, salt, and baking powder. Mix until smooth. Add rice flour, potato starch, cornstarch, and xanthan gum. Stir just until smooth. Bake for 12-15 minutes or until toothpick inserted in comes out clean. Let sit in pan for several minutes than remove to wire rack to cool. For cinnamon topping: Combine 1 teaspoon cinnamon and 1/2 cup sugar. Dip tops of doughnuts in melted butter and then into cinnamon sugar mixture. For chocolate topping: Use the chocolate glaze from my gluten free chocolate doughnuts. 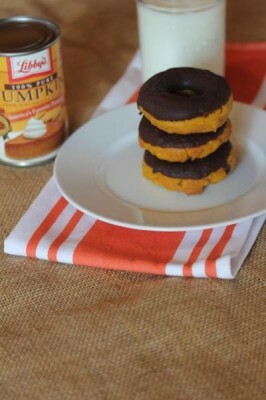 Hi- I love all things “Pumpking” and these look scrumptious! I am new to the gluten-free baking world and have a sensitivity to potatoes. I notice lots of GF recipes/baking require potato starch- Can anyone recommend a good substitute? Thanks! I would try cornstarch in place of it. It is a little different, but usually works okay. You will need to watch pre made gf blends that you can buy because many contain potato starch. And I know how overwhelming gf is in the beginning, it does get easier, so hang in there. If I use GF all purpose flour in lieu of white rice flour and starches, how much flour should I use? Plan on making these on Saturday for a party! Thanks! Could you substitute gluten free all purpose flour for the rice flour and starches? I like this mix of flour and starches, but yes it would probably work fine to use a pre done gluten free all purpose flour. Just made these tonight and they were a huge hit, even with the gluten eating folks. Mine didn’t rise as much as yours, thoughts? It might be that my pans are deeper or I filled them fuller so mine just look like they rose more. Or it could be the brands of ingredients, since that can make a difference sometimes in gluten free cooking. I am so glad you enjoyed them though! I made these tonight as cupcakes, since I don’t have a doughnut pan. They are spectacular! I had to sub tapioca starch for the potato starch since I couldn’t find any at the store. They are still super yummy! Thanks for the recipe! I wrote about your recipe on my blog! 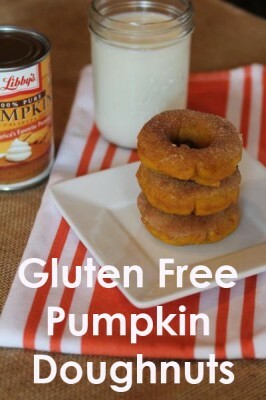 i LOVE fall and in the fall i LOVE to bake-but being gluten free it is so difficult as you know. i was so excited to see this and try these out-until i saw the potato starch. is there a substitute to potato starch? i cannot use that-i have a reaction to anything potato…is arrowroot starch similar? im not by any means a baking pro-cant make up my own recipes-but i can follow them great! 🙂 i have no ideas what the different properties of different starches are and what they are used for. thanks you for any insight you may have! i may have to just attempt it with arrowroot-and see what happens! I have not baked a lot with arrowroot, so I am not sure. I think it is worth trying though. You could also try tapicoa starch, I think that might be a good one too to try. I hope they turn out and that you enjoy them!